Having an eclectic taste has been a fashionable choice for a while. It means that you don’t just go into one store, buy everything there, and have a perfectly matching house and wardrobe. Instead, you have found things that really speak to your personality and created an interior with a most interesting dynamic. But sometimes, what eclectic means is frugal. You didn’t shop at just one store because you know where the better deals lie. You are willing to trawl through flea markets to find a vintage sofa half price and you know that inheriting things from your parents and grandparents is the best way to fill any home. When you’re trying to get along on very little money, setting budgets for yourself is the best way to manage your finances. Not only will you see just how hard you have to work for each thing, you will also be able to set a realistic time frame to get what you want. If you can take on odd jobs here and there or find ways to make extra income, you will certainly benefit and get your want list faster. Make a list of all of the things that you need and want in your house. This should include everything from the necessaries like a sofa to the more decorative, like mirrors or cool TV stands. Put a rough estimate on how much you would like to spend on each thing, then put them in order of priority. So, if you have nothing to sit on, the sofa will come at the top, if you already have a sofa that will do, it goes at the bottom. Now you can see how much you need to earn and save and can gradually tick things off of the list. To bring the price of your list down, you should look for opportunities to make do with the things you have. Mending a sofa could be cheaper than buying a new one, so have a look at what you’ve got and see what you can do with it. This attitude is also really helpful in charity shops and flea markets that sell second hand furniture. If you think that something is salvageable, you could get a really good bargain on it. When you are in the habit of making the most of what you’ve got, buying new just won’t have the same charm. 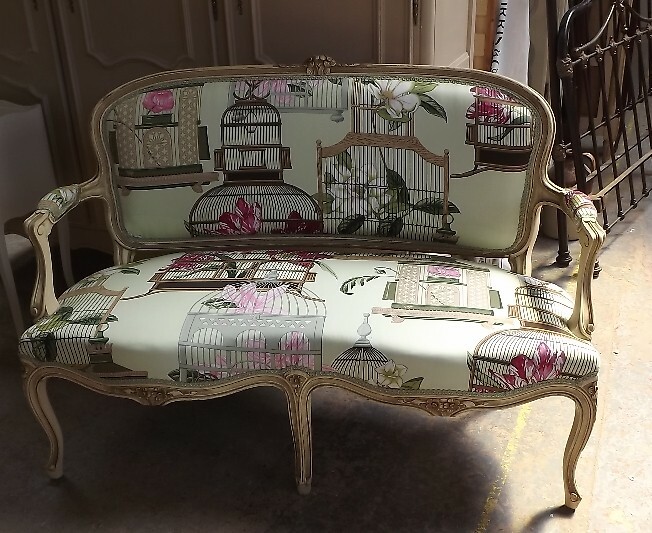 Staying on the sofa theme, upcycling is often a really good way to make something old and worn new and beautiful. At the very heart of the eclectic style is the idea that you can reupholster any classic sofa in a vibrant modern fabric and achieve a completely new and beautiful look. You should also be on the lookout for things that you can use in other ways, too. You would be surprised at the things you can make use of to great effect. Have you ever thought of using colanders as a set of bath shelves? No? Here’s how you can make that happen! Eclectic is cool and is a great way to ball on a budget. Let your personal style shine through with quirky choices and turn your home into a charming space in no time. Loved this. I definitely am a woman of eclectic taste and found this very informative. Thanks for posting! Teresa of FTAB. but of course! thanks for stopping by!! I agree that eclectic style saves money. If you are willing to wait and collect things slowly, you can scoop up awesome pieces over time for less money.